To better understand the origin of the orchid flower you need to discover the history it shares and what has made this flower gain an edge over other flowers in terms of its expense and many other desired features? Eurasia, America and Canada are known as the homes of orchid but today they are found almost in every part of the world except for the arid zones. However, there are few arid areas that support the growth of orchids but very few species are native to such locations. This is where it belongs to, coming to the origination of orchid, its first specie, comes a long history, attached and associated with different ways of treating, keeping, growing and discovering an orchid flower. A French botanist, Noel Barnard, was the first to discover this magnificent flower. Back in the year 1899, he came across seeds of a terrestrial orchid, Neottia. He discovered that these seeds had germinated in some fruits which were infected by mould. He collected it, thereby realizing the significance of it, and produced a hybrid of orchid called Laeliocattleya with the help of pod parent. He further experiment it with fungus, sucrose and mixture of salep and produced more hybrids of orchids, marking a breakthrough foundation for the American history, taken forward by Dr. Lewis Knudson, an American scientist. Another discovery was by Charles Darwin. He noted that a single orchid plant, specifically Orphys Maculata (Origin: Europe), produced enough seeds in one season. The amount is too much to exactly calculate but he discovered that this will continue till the day the whole earth is filled with orchids. This is how one orchid gives birth to several and it becomes a continuous process. Pollination is an important process for the orchid. It was discovered later that it is done so by the insects as they carry it from one orchid to the other and then help in the fertilizing as well. There were even instances in Darwin’s book on the orchids’ pollination that this one specific orchid, Star of Bethlehem, must be pollinated by the moths found in Madagascar. Knowing that orchid have a tremendous scent but we are unfortunate to smell it, insects are wildly attracted to it. Most white orchids are pollinated by night-flying moths, colorful orchids usually by bees and the smaller orchids by mosquitoes. And coming down to the fact that such an important process as pollination is done via the help of specific insects; this could be one of the reasons why it is rare and expensive. Once the insect is lured to the flower, colorful markings and ridges on the lip serve as guides to lead the insect towards the nectar, causing the insect’s head to come into contact with the stigma. The insect, when lured by the scent of the orchid, they sit and fall into the liquid glands of the orchid. In an effort to escape, they pick up pollen on the way and head out from the lip of the orchid. As the orchid start to bloom in the season and tries to come out, the pollen is deposited on it. The insects are not always specific to the region and it is not easier to find one that fits any particular orchid’s requirement. It is a trial-and-error most of the times and hit-and-miss when it comes to the pollination. 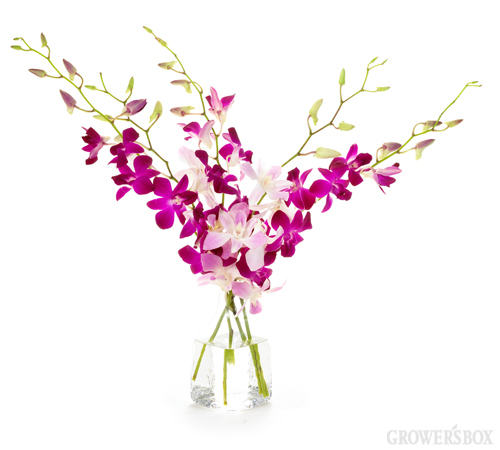 The process of production and discovery of yet more orchids has become simpler these days. Even in the days when the processes was once complex and it was a challenge for orchids to be imported to other regions or survive in the green houses, they were admired and cherished. ← What is the King of Flowers?